Eligible resident id (iqama) professions for Saudi Arabia's permanent family visa or family visit visa. For finding your profession from the above use Ctrl+F and type your profession. 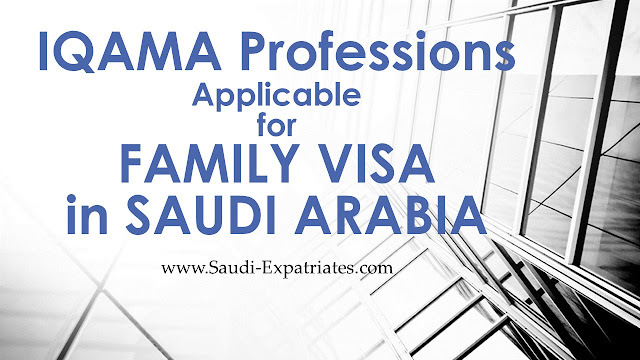 All these professions are valid for applying family visa in Saudi Arabia either it is visit or permanent. My profession on Iqama is"compound supervisor:.Can I sponsor my family on permanent visa on this profession? I hope technician is eligible, You can ask your sponsor. my profession in iqama is QUALITY EXAMINER.... can i bring my family on permanent visa......??? You can check with "ONLINE PERMANENT FAMILY VISA APPLICATION", Whether this application allows you to apply or resulting in some error. my profession in iqama PRINTING DESIGNER (مصمم طباعة) can i bring my family on permenent visa ? You can check whether online application allows you to do or not. my profession in iqama general draftsman can i bring my family on permenent visa ? can anyone help me, my profession on my iqama is "Quality Systems Coordinator" but I could not find this in the list but found "Quality Controller" only. Am I eligible to applay for family visa online with my current profession..?? Please try online application and see whether it will allows you or not. Please try online MOI application, And see whether it will allow you or not. "Marketing Specialist" Can this be applied online without any appointments at Isthiqdham.? Can someone suggest me for family permenet visa my profession in Iqama is Building Technition ? And i work in a company on Quantity Surveyor ? Did you try online application? If its asking for appointment, Then you should follow, Else wait till they approve this profession online without visiting istiqdam. It is illegal to have different profession on your iqama, rather than your work, You can ask your sponsor to change in the way, which is suitable to your job and eligible for permanent visa. Can anybody suggest me which profession i can get for family permanent visa in the light of below. i have BA degree and MA political science degree, i am working in HR/Admin department of an IT company.